Commercial Bank was declared the ‘Best SME Bank’ in Sri Lanka in 2016 by International Finance Magazine (IFM) of the UK, for ‘making a significant difference and adding value, and achieving the highest standards of innovation and performance’ for Small and Medium Enterprise clients. The award also recognises the bank’s contribution to raising the bar in the local financial services industry, including in corporate social responsibility and better corporate governance, in IFM’s ‘Financial Awards’ category. 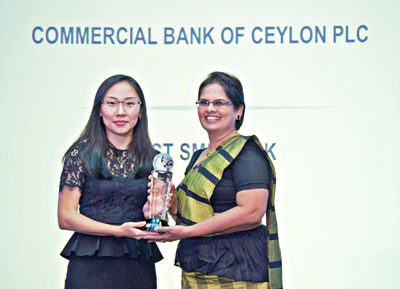 Commercial Bank Deputy General Manager – Personal Banking Sandra Walgama was in Singapore recently to accept the award at a gala ceremony at which many award winners from across the world gathered to celebrate their achievements.